If the world was truly a rational place, men would ride sidesaddle. “So what do you think this is?” Foster asked Straker in a quiet aside, both of them saddling their horses. The alien device had gone into one of the electronics chests with Foster’s help. The piebald kept evading the bit, butting Straker’s chest every time he tried to slip the snaffle past his lips. 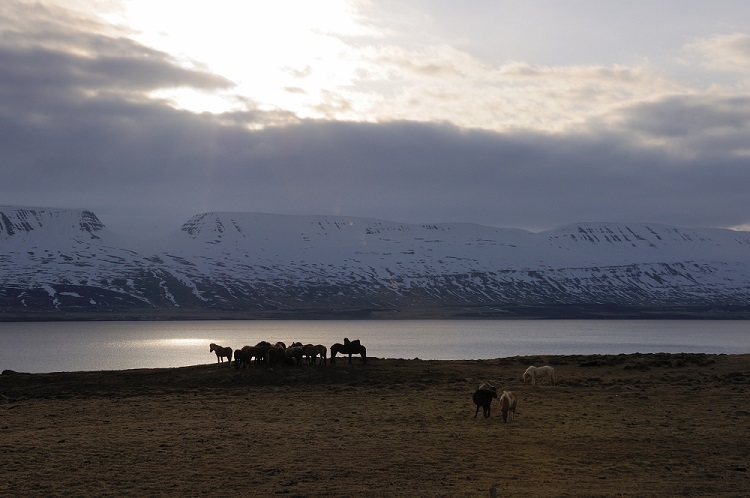 As he had learned this morning, the horse’s name was Flekkur, the icelandic word for “pied”. Without ostentation, but clearly visible for his commander, Foster pushed the snaffle into the mouth of his own mount, showing him how to force the jaw open with a finger thrust in sideways. Straker flashed him a thankful glance and finally managed to bridle the piebald using that trick. He was somewhat in awe of the gelding who was much more lively and muscular than the old mare. The atmosphere inside the camp was one of unease. As had been agreed between them during the night, the chief had kept Ragnar and Eric in the dark about the exact nature of what had happened during the night. However, Straker’s surreptitious observation of the couple, as well as Foster, showed him that some of what the alien had done, had had effects on them all. They were all on the edge. The stallion had ceased his nervous patrol the moment they alien device had been deactivated, and had allowed Unnur to catch him and lead him back into his enclosure. Straker could see she was mounting, leading the black already at her side. He ignored the sharp protest of his overtaxed muscles and swung into the saddle. He suddenly could not help grinning to himself, Jackson’s prescription was working. There had not been a saddle sore in sight, in spite of a whole day on a horse. He swung Flekkur around, setting off behind Ragnar and Eric. The whole treck splashed through the brook near which he and the chief had lain and watched the alien approach. Straker cast a casual glance at the mound near the underbrush close to the river bank. Impossible to tell what was resting beneath it he noted with satisfaction. That left the question of how he ought to proceed with Unnur. The dilemma had kept him occupied and wide awake most of the night. The amnesia drug was no solution, it would not erase the past decade and that was as long as she had known about S.H.A.D.O.. Eliminating the CSS of a state partaking in the anti-alien alliance General Henderson and he had forged a decade ago was not going to be taken in a friendly manner, and there would be investigations, even if he staged an accident. She had two agents along, which would not make this any easier. In fact, there was that nagging worry that he might not even be able to do that. So far she had bested him, been a step ahead at every turn. She even knew that he was supposed to correct the breach of secrecy. However, not the least of everything was that he did not want to kill her. Later he could not have said when exactly they had left the vast steppeland they had been travelling through during the first day. He realized the terrain was becoming quite difficult, when he had to grab the mane of his colourful gelding not to get separated, feeling the muscular animal toil under him to make it up a short, pebbly rise. Ahead the rest of the riders were already gathering in a group, loose horses clattered past him, and he recognized the little mare he had ridden yesterday. Straker turned around to get his bearings. How the hell had he drifted off into day-dreaming anyway? The plains lay a good 500 yards below them now and stretched to the horizon, the river they had crossed a far-off silvery band in the mist. Everything was covered in lichen and moss. He watched the riderless horses nibble with obvious delight at a variant looking grey and delicate. Swathes of mist, or low, moist cloud cover clung to the side of the mountain range they were working upwards. Even though well into the morning the daylight never had taken firm hold, gracefully giving in to shadows and vague impressions. Unnur was coming up behind him, clattering across the loose pebbles and stones on her pale mare, the stallion in tow. She looked at him, her mouth twitching in a quirky smile. “Let’s hope that the giant won’t wake while we travel across his shoulder,” she said in a quiet tone. “Yes,” Straker nodded. “Out here this makes sense.” For a split second her smile flared, lit up her face, then made room again for the ironic, lopsided grin she habitually reserved for him. This time though he could not help smiling back at her. “Just around that outcrop and we camp down for lunch,” she explained. His gelding seemed to know he was in for a pause, the animal needed little persuasion to join the rest of the travellers. Straker realized they must be travelling up the former bed of a glacier, the rocks and pebbles ground to a smooth, round finish during their slow journey down the mountain-face. Even the huge chunk of stone they rode around to their rest place must have travelled down from the top. There was a sense of awe instilled in him right then which was not dissimilar to what he had felt every time he looked at earth from space. Nature at its harshest, most beautiful, overpowering and paling human influence into insignificance. No, they would never get that. Not as long as he lived. “I can’t find it,” the sharpness in Colonel Lake’s tone was not directed at him, Alec knew. She was short with herself and the lack of results she had produced so far. In all fairness, Lake, Barton and Ford had been really hard at it since early morning. The colonel had ordered the Cambridge graduate SHADO hat recently recruited, on the premises he had established under tuition of Hawking’s best, quite peremptorily out of bed and into HQ. He had watched them try dozens of different calibrations and what he recognized to be quite a few extraordinary assumptions as well. To no avail. The UFO they knew to have landed in the region where the commander and Foster were travelling stayed stubbornly hidden from any and all devices, even the technically most advanced they had. Nor did any of the skydivers produce better results. Carlin had organized a regular, repetitive sweep, had even verified from an altitude above the range high enough to be safe that the group of riders still was under way and apparently unharmed. However, there had been no UFO. No debris either. With a sigh Alec ran a hand over his face, felt the stubble on his chin and cheeks and decided it was time to shave and freshen up, to make himself presentable again, time for a cup of coffee, before this hunt continued. A UFO, rocks, lots of them, and no water, only ice, his thoughts drifted, where the heck could it be? The rest at the foot of the glacier had been short. After making them switch horses Unnur had pressed on, forcing them to cover nearly as much distance as they had down in the steppe. “What are you worried about?” he asked in a tone low enough not to carry upwards to the others. “No such luck until we’re up at the station,” she answered, absentmindedly curbing the black horse engaged in impatient antics at her side. Unnur looked at him, surprised more than anything else. She had to stay on edge, this one was not thinking in boxes, and he was sensitive enough to catch on to things she thought were well-hidden to him. She looked into the thoughtful blue eyes of the man listening to her, then shrugged and gave a laugh. Throughly enjoying this, I can imagine the settings so clearly. Straker and company on horse back lovley. Love this as well, AnDelendir! And looking forward to the next part!! !